First launched at Climate Week NYC 2014, the RE100 initiative is designed to bring together influential corporations which have committed to sourcing 100% of their electricity needs from renewable energy sources. Run by non-profit The Climate Group in collaboration with CDP (formerly the Carbon Disclosure Project), RE100 currently boasts 155 members (as of November), having brought 37 new corporations on board in 2018 alone. If RE100 were a country, it would represent the 23rd largest electricity consumption in the world, at 188 terawatt-hours (TWh) annually, and boast combined revenue of $4.5 trillion, 5% of global GDP. In 2018, the RE100 initiative was able to greatly expand its global markets, now impacting more than 140 markets around the world. The initiative has identified Japan, Australia, Mexico, Turkey, and Taiwan as growth hotspots. It’s not just commitments being made, either, but successfully achieved commitments, with 37 companies already boasting in excess of 95% renewable electricity, and 6 having reached their 100% goal. “With so much depressing news at the moment, here we have a refreshing, positive story of how ambitious corporate action is changing the world for the better,” said Helen Clarkson, CEO, The Climate Group. “We congratulate RE100 members on the progress they are making by building renewables into their growth strategies, and engaging policymakers and suppliers. This is what all leading multinationals should be doing. 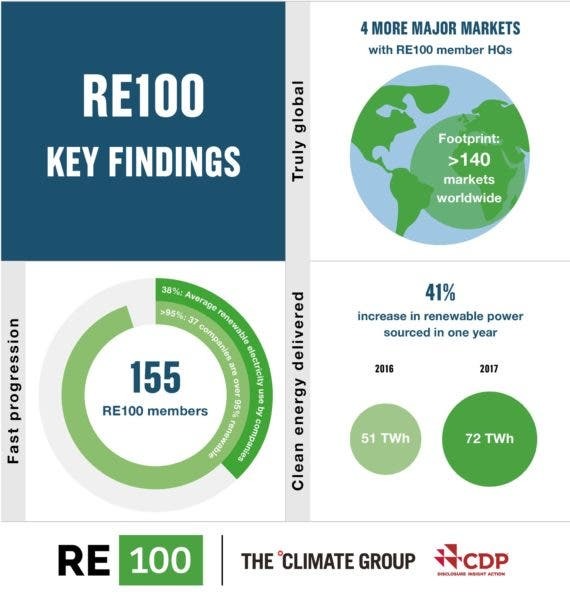 “Over the past year we’ve seen rapid geographic expansion of our membership that has transformed RE100 into a truly global movement,” added Sam Kimmins, Head of RE100, The Climate Group. “This is hugely exciting and has the potential to shift entire markets in places like Japan, where policymakers are taking note of the demand signal being sent by our members. Helen Clarkson’s comment that the RE100 initiative “should give national governments the confidence to set more ambitious emissions reduction goals” is important, because as time goes by we are seeing non-national actors stepping up and increasing climate ambition, often over and above that of the nations which they call home. “Non-national actors are incredibly important in driving adoption of renewable energy, which is why The Climate Group works with both businesses and sub-national governments as secretariat of the Under2 Coalition,” explained Sam Kimmins, Head of RE100, The Climate Group,” who spoke to me via email regarding the importance of non-national actors. What’s more important is that not only is the work of non-national actors such as corporations reaping its own rewards and benefits, but it is impacting governments around the world. That same impact that has been seen throughout Europe also partly explains why European-based companies are so dominant in RE100. 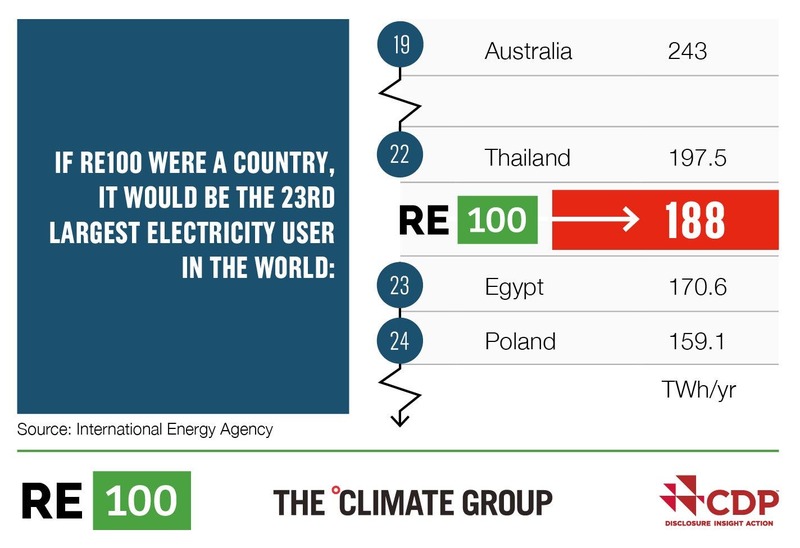 Specifically, Europe boasts 77 RE100 members, while North America is home to 53. Well behind is Asia with 24 and Oceania with only 1 — though, importantly, 10 of the new 2018 members are based in Japan, showing that country’s growing importance. As to why Europe and the US remain so dominant?